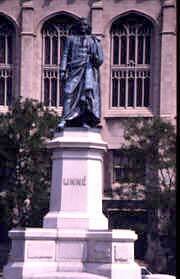 Statues have been raised in many places throughout the world to honour Linnaeus. This one is outside the University of Chicago. Photo: Hans Odöö. Linnaeus died on January 10th, 1778. He was succeeded as professor by his son who, however, died already in 1783. Then Sara Lisa sold her husband’s collections, including tens of thousands of plant, animal and mineral specimens as well as thousands of books, to an Englishman named Sir James Edward Smith. The Linnaeus collections are now kept by the Linnean Society in London. Two of Linnaeus’ daughters had children and there are today about 200 descendants of Linnaeus. However there is no one with the surname “von Linné” since Carl Jr never married. Linnaeus’ classification of nature and his binomial system spread throughout the world. Thus, in natural history books in every country Carl Linnaeus from Uppsala in Sweden is mentioned. After the death of Linnaeus there were many who admired him and still today people say that Swedes are influenced by his feeling for Nature.